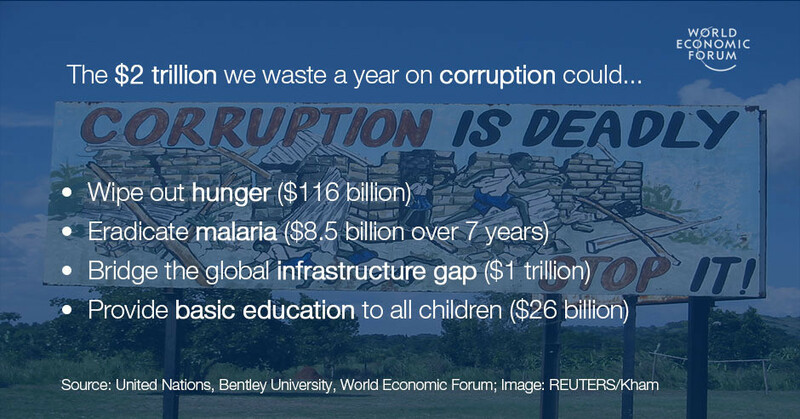 Every year, we waste $2 trillion on corruption. If that sounds like a lot of money, that’s because it is – and it’s just the tip of the iceberg. In fact, this already gargantuan figure only takes into account money spent on bribes, and doesn’t include the more difficult to quantify economic consequences of graft – lost investments and a reduced tax base, for example. Of course, when we start talking about billions and trillions, the numbers start getting a bit abstract. To help put the scale of the problem into some context, here are four global challenges we could tackle with that money – and still have some change left over. From Yemen to Madagascar, conflict and natural disasters have led to devastating famines, and around the world nearly 800 million people don’t have enough food to eat. But it doesn’t have to be that way. In 2015, the UN estimated that by investing $116 billion a year – a drop in the ocean compared to the trillions wasted on corruption – we could wipe out hunger in a little over a decade. In 2015, 212 million people were infected with malaria, and 429,000 of them died. That same year, 34 nations committed to eradicating the disease over the next 15 years. To do so, researchers estimated it would take $8.5 billion in funding – starting at around $600 million a year through till 2022, dropping thereafter. This figure has been described as “very conservative” in that it doesn’t take into account issues like drug resistance. “The target is constantly changing, so we may have to re-cost malaria elimination in a few years’ time,” one of the researchers warned. Still, $600 million a year seems like small change when compared to the amount being frittered away on corruption. Infrastructure – our roads, bridges, electricity grids – might not sound particularly alluring but it is literally what keeps our cities, countries and regions ticking over. Despite its importance, we’re not investing the money required: while we should be spending $3.7 trillion each year, we’re falling short by $1 trillion. This crumbling infrastructure is a huge drain on our economies – in the US, it could cost 2.5 million jobs and $4 trillion in lost GDP between now and 2025, according to researchers. Education might be the “great equalizer” but for many children around the world – 100 million, says the UN – it’s something they can’t access. But according to 2014 research, if we were to invest just $26 billion each year into the problem, we could provide basic education to all children in 46 low and middle-income countries. Kenneth Rogoff: Is it time to say goodbye to big banknotes?